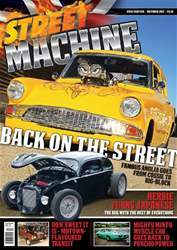 The days are getting shorter but here's a ray of sunshine - a bright yellow, big-block Pro Street Anglia on the cover of the December issue. Or how about a fenderless, roof-chopped Beetle with Japanese turbo six-pot power? Or a classy Seventies custom Transit, 40 years late? Or a Pontiac that's been out a while but is still minty fresh, now with injected Poncho motorvation? There's all that, plus all the late season shows and events, the last races of 2018, all the usual fun and much, much more in December's Street Machine, out now!